The warmist response to Climategate — the discovery of the thoroughly corrupt practices of the Climate Research Unit (CRU) — was that the tainted CRU dataset was just one of four independent data sets. You know. So really there’s no big deal. Thanks to a FOIA request, the document production of which I am presently plowing through — and before that, thanks to the great work of Steve McIntyre, and particularly in their recent, comprehensive work, Joseph D’Aleo and Anthony Watts — we know that NASA’s Goddard Institute for Space Studies (GISS) passed no one’s test for credibility. In fact, CRU’s former head, Phil Jones, even told his buddies that while people may think his dataset — which required all of those “fudge factors” (their words) — is troubled, “GISS is inferior” to CRU. To reiterate, NASA’s temperature data is worse than the Climategate temperature data. According to NASA. 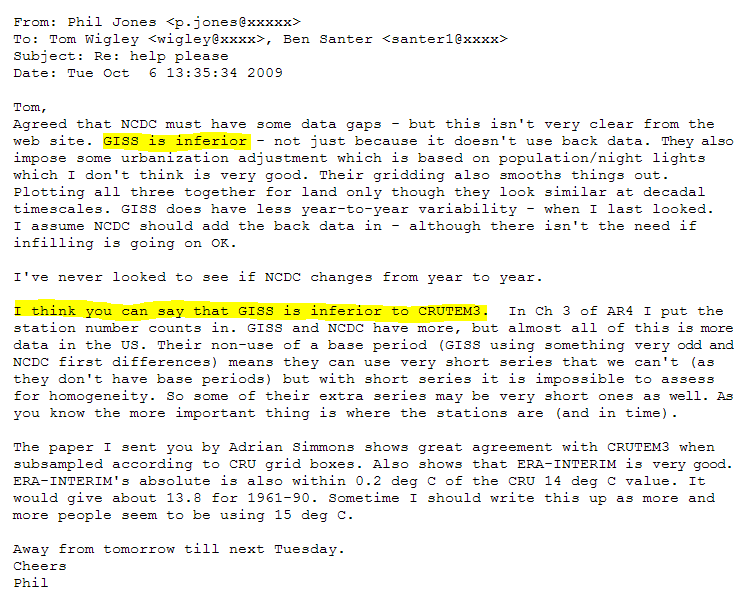 And apparently, although these points were never stressed publicly before, NASA GISS is just “basically a modeling group forced into rudimentary analysis of global observed data.” But now, however, NASA GISS “happily [combines the National Climatic Data Center (NCDC) data] and Hadley Center’s data” for the purpose of evaluating NASA’s models. But one of the three remaining sets is not credible either, and definitely not independent. Reto Ruedy refers his inquiring (ok, credulous) reporter to NCDC — the third of the four data sets — as being the gold standard for U.S. temperatures. But NCDC has been thoroughly debunked elsewhere — Joseph D’Aleo and Anthony Watts have found NCDC completely incredible, having made a practice out of not including cooler temperature stations over time, exaggerating the warming illusion. Three out of the four temperature datasets stink, with corroboration from the alarmists. Second-sourced, no less. This entry was posted on 11 mars, 2010 at 11:07 e m and is filed under Fri- och rättigheter, Miljö - Environment, USA, Yttrandefrihet. You can follow any responses to this entry through the RSS 2.0 feed. You can leave a response, or trackback from your own site.